Born in 1944 in California, George Lucas was a short step ahead of the burgeoning baby boom, and enough in tune with that generation to be able to plug into the interests and concerns of the largest movie-going audience in American history. A graduate of University of Southern California Film School and mentored by Francis Ford Coppola, Lucas co-founded American Zeotrope with Coppola in 1969. In his directorial debut in 1971, Lucas created the feature length film THX-1138 based upon his award-winning film school short. The film was a commercial disaster that even such acting heavyweights as Robert Duvall and Donald Pleasence could not save. A dystopian future where humans are heavily sedated drones... well, the market for such a film just wasn't there. But Lucas' next outing in 1973 was a home-run. American Graffiti was an ensemble coming-of-age ramble through the cruising lanes of 1960s small town America, with a soundtrack to match. The film earned Lucas a Golden Globe and numerous other awards, and more important for Lucas' future endeavors, it make the studio money. It also introduced the viewing audience to a number of young actors who would soon become much more familiar - Richard Dreyfuss, Cindy Williams, Ron Howard, Mackenzie Philips, Suzanne Somers. Oh, and Harrison Ford. George Lucas is such an institution and a powerhouse now, it's hard to remember that he had difficulty getting funding for his next project. But a director who had a hit with an intimate low-budget coming-of-age teenage film will find it easy to get backing - for another intimate low-budget coming-of-age teenage film. Lucas proposed for his next project a big, sprawling space epic, with a galactic empire, space battles, and a talking gold robot. Audiences had shown they would follow Lucas to the cruising lanes of their youth. Would they follow him to 'long ago in a galaxy far, far away'? The suits were skeptical. Of course, eventually the money came through and Star Wars (later renamed Star Wars Episode IV: A New Hope) was made, and the rest, as they say, is history. Star Wars wasn't just a hit, it was a mega-blockbuster, the highest grossing film to date. And from that point on, George Lucas could pretty much do what he wanted in the way of film-making. The next two segments of the Star Wars saga, The Empire Strikes back (1980) and Return of the Jedi (1983) were also blockbusters. 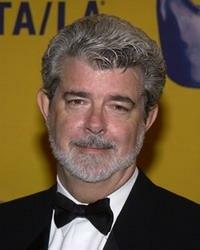 George Lucas by now was a movie making empire, creating his own production company Lucasfilm, and the special effects company Industrial Light and Magic to handle his own and other film-makers' special effects needs. In another hugely successful film franchise, Lucas created the character of swashbuckling archaeologist Indiana Jones and teamed up with Stephen Spielberg for 1981's mega-hit Raiders Of The Lost Ark (Spielberg directed, Lucas co-wrote and executive-produced). Not everything Lucas touched turned to gold. Notable misfires that he executive-produced include Howard The Duck in 1986, the quest fantasy Willow in 1988 (Ron Howard directed, with story by Lucas), and the biopic Tucker: The Man And His Dream, also in 1988. From the outset, Lucas had always described his Star Wars saga as the middle trilogy of a nine-story arc in his head, though the only one he intended to film. But as the 1990s progressed and film, computer and special effects technology developed, he rethought that decision and determined to go back and film the stories of the first trilogy, bringing us up to where the original Star Wars started out and showing how we got there. Episode I: The Phantom Menace was released in 1999, Episode II: Attack of the Clones in 2002, and Episode III: Revenge of the Sith in 2005. This new 'first' trilogy were all also financial blockbusters, though the critics were less kind. Visually gorgeous and obviously with no expense spared, a muddled and unconvincing plotline made this trilogy harder to love than the earlier, less technically marvellous but more heartfelt offerings. Of course, that didn't stop the fans from lining up for the premieres days or weeks in advance, often in costume. With Star Wars Lucas created or popularized a philosophy and a way of looking at life that for many people was permanently compelling.